Want more Halloween candy-free Trick or Treat alternatives? Here are more candy-free options for you to give out in kids’ Halloween loot bags. These are more cool and fun for kids to receive than the usual treats. Plus you can enlist their help in making them. 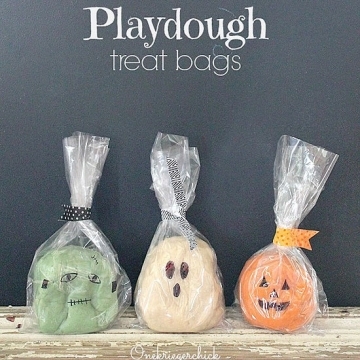 Have fun making the play dough treat bags, popcorn treat hands, pumpkin crayons and gal capsules. They will surely be a hit with your Trick or Treaters! Reluctant to contribute to the neighborhood sugar rush this Halloween? Instead of giving candy to the trick-or-treaters who come to your door, try passing out one of these awesome no-candy treats that kids will be just as excited to get. Related Article: Want Great Halloween Candy Alternatives?